Andrew and Nicole had a stunning fall wedding at RiverCrest, located in Phoenixville, Pennsylvania. 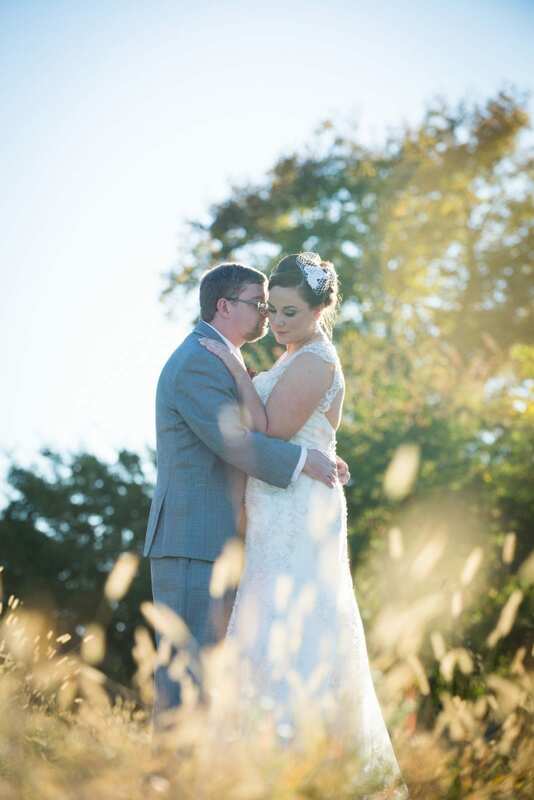 The grounds surrounding the venue along with the gorgeous weather, enhanced their fall theme which was captured beautifully by their wedding photographer, Leah MacDonald. The Groom and his groomsmen wore silvery grey tuxes accented with burgundy boutonnieres that complimented the bridesmaids’ dresses perfectly. The flowers were filled with shades of deep red that had pops of yellow, orange, and a crisp white creating a wonderful fall color scheme. Nicole walked down the isle in a beautiful beaded dress by Maggie Sottero, pearl jewelry, “something blue” shoes, and a hand beaded birdcage veil that used a piece of lace from her mothers’ wedding dress. Andrew and Nicole were married under a charming wrought iron arch that was handmade by the Bride’s father. After the ceremony, the arch became a prime spot for guests to take photos when they weren’t too busy enjoying the Groom play guitar with the band. The perfect evening ending with the guests sending the Bride and Groom off with a dazzling “Sparkler Finale”. FROM THE BRIDE & GROOM: The beginning and the end, both were full of love and happy memories which will last a lifetime. We had our ceremony in the Roberts room, because we knew inside under the arch my dad made, and close to all of our guests who were there out of love. Then at the end Big Ric got everyone on the perimeter of the huge dance floor, and had everyone rush in for a massive group hug, it was amazing to visually see each and every one who loved us showing it.